Loose skin weight loss fear is one of the major reasons I hear women use for not considering Raw Food Boot Camp and our amazing diets. I believe this fear is overrated and needs to be removed from excuse lists that keep women from going after their weight loss goals. When I was losing my weight, I had this fear as well. Every day I lathered myself with a half and half combo I made from Aloe Vera gel and Suave’s Collagen and Elastin cream. When I reached goal, I had some wrinkled skin, but not excess skin. That wrinkled skin was on my upper inner thighs and my upper inner arms. Do I hate that? Sure. But a longer sleeved shirt and shorts hide it and I feel great. Why didn’t I get what others consider loose skin after losing 139 lbs in 9 months? I’ll tell you what I believe. First, our diets are so healthy our skin tends to glow and you quickly see your skin health improve. Second, and this is my theory based on pulling at the skin on my hand. If you grab skin without any underlying fat, you have this small thin layer between your fingers. Not inches, just this thin pulled up skin. That is skin. 7 thin layers only millimeters thick, not inches. But, skin is attached to underlying fat and muscle. Where does this Loose Skin Weight Loss Fear come from? Loads of pictures of people with hanging bellies and upper arms after big weight loss? No, it comes from a few and questions by good meaning friends and families instilling and perpetuating this fear. I’m not saying it doesn’t happen, but our diets are so healthy, it isn’t as bad for us. I would say, my skin after weight loss was less than 1/4 of how I thought it would be. Negatively thought it would be. That means it was about 80% better than I expected. I won’t say some don’t need surgery to get all that excess off, and even at camp we’ve had a few women get tummy tucks when they are done, but nothing like you see in some of the before and afters with unhealthy diets and surgery. Here is what I believe happens. 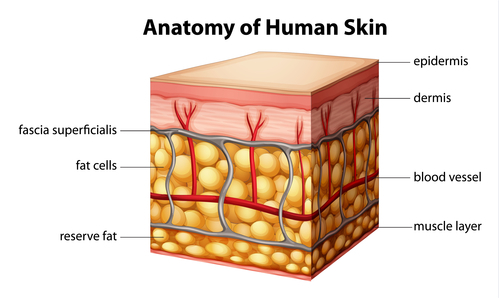 When we gain weight, out skin surface increases as our fat cells expand. When we lose weight, those fat cells shrink, some are emptied and we get this sense of loosey-goosey flesh. At camp, this stage happens to everyone and is disheartening. I call it the watery fat stage. But it is just a stage. And if you keep at the weight loss and don’t get discouraged, this stage will pass. Until all the fat cells are emptied there is extra baggage attached to that skin that makes it droop and look like what people call loose skin. 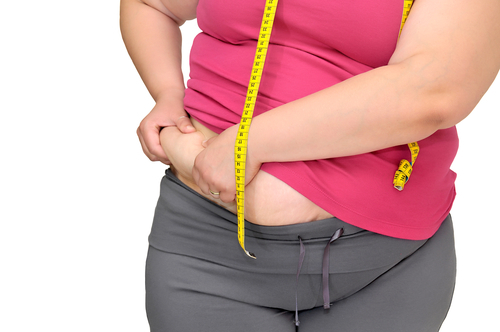 For obese women losing weight, the most prominent issue is what many call the belly apron. It is the midriff slipping down to and sometimes past the groin area. Let’s look at it reasonably. You were obese. You had a big belly. The surface area of your belly is large. But it is supported by the underlying fat, so it does not droop. Now you remove half of the fat from that area. Half of the support. What happens? Droop. This isn’t a skin issue, it is an underlying fat issue. Imagine a blow-up pool raft. You fill it with air, it’s taut. You can pick it up at one end and it retains its shape. Right? Now take half the air out and try holding it up. It droops. You could try this yourself. Pick up a bunch of bath oils that come in round capsules. Wrap them tight in some sort of netting. See how they form a rounded hard shape. Now without changing the size of the netting puncture each capsule and remove half of the oil. That netting looses its shape and the whole thing is now squishy. When we remove fat, that solid mass underneath doesn’t hold up the less filled area anymore and we get what we perceive as loose skin. There is still fat there, but not as much and not as firm. Loosey goosey. 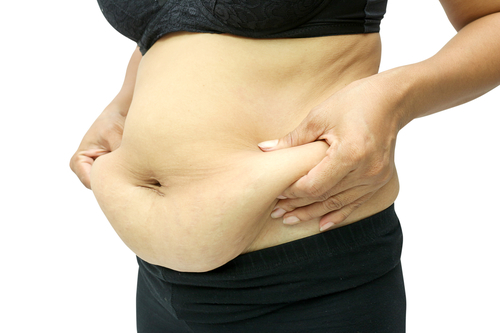 If you were to lose that excess fat, all that would be left is skin, skin which is at its thickest 5mm! Not inches, millimeters! Think love handles. We all know what they are. When you grab them you grab a handful of fat. We have all done that. Think of this loose skin as excess love handles and your view of what loose skin is will change. So then why is this such a big issue? Get to goal and there is no loose skin. Right? Well, that may not be totally accurate. Morbidly obese people may have a lot of excess skin layered by stubborn fat that they will either need to learn to live with or have surgically removed. But when I say morbidly obese, I’m not talking 100 or even 150 lbs overweight. So for most of the women who come to camp, if you get down to 22% body fat, this probably isn’t going to be too much of an issue. Even those with 200 lbs gone haven’t had anywhere near the end results loose skin fears suggested. With our raw food diet and walking, we have much better results with loose skin issues. Be warned though, body fat doesn’t always play fair. One thing I never got rid of was my muffin top or this piece of fat under my chin. As for the muffin top, I remembered that even in my 20’s at my thinnest of my life, I still had a muffin top (I blame all those tight jeans). Why at 48 and at a goal ten pounds higher than my thinnest weight did I think I wouldn’t have one? Sometimes you will meet thin women with bat wings for upper arms. Oh, how we all dread that. Is it loose skin? Not in the sense that it’s the skin that’s the problem, it’s the heavy fat attached to skin that causes the droop. The skin has lost its elasticity and no longer has the strength to hold up the weight. Even older thin women sometimes get bat wings. But then is goal weight enough to get rid of loose skin? Probably not. Most obese women set their goal weight at the top of the BMI chart. To really get rid of the fat causing the perceived loose skin, you would need to get down to about 10% fat, and face it most don’t want to be that thin. That is where you have to come up with alternate plans. For some, where the loose skin is unbearable, surgery may be an option. Just remember, it leaves your body unbalanced in fat cell distribution so if you gain weight, you may gain it oddly. Another solution is to prop that area with muscle. You can’t turn muscle into fat, but you can make your body look toner. Upper arms are a great example of this. If you are at goal and your upper arms are dangling. Start working with weights to bulk up the triceps. Skin is attached to fat and muscle. The muscle will pull up that dangle and make your arms appear younger and more toned. Strengthen those abs. Build a tight stomach and a lot of that hanging apron will fill out and appear much nicer. There are ways to cope with this perceived loose skin, you have to be willing to do them and live with the new thinner imperfect you. It’s time to drop the loose skin weight loss fear! Yes, after being obese for years and stretching out your skin, you are not going to get to goal with a perfect body if you are over 40. Stretch marks are not going to go away. And your breasts will droop. But is that worse than living in a fat suit where everyone who looks at you judges? Where you hide from family photos and fear getting on amusement rides because the lap bar may not come down? Living thin is more than how the body looks. It is about having the energy and vitality to live life fully. It’s about health and quality of life. Wearing 3/4 length sleeves and longer shorts is not optimal, but being able to play with my family, to keep up and be considered fun by my granddaughters makes it a thousand times better than being obese and having plump filled out upper arms and thighs. Rethink your fear of loose skin. Don’t let it keep you from doing what you need to do for health. It is a minor leftover for most and a reason for a tummy tuck for some. It is not the end of the world. Where obesity could be.